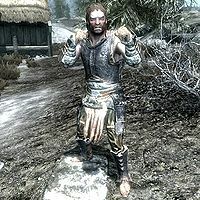 Benor is a Nord warrior living in Morthal. He claims to be an amazing fighter and is ready to prove it for a bet of 100 gold. If you defeat him, he can be recruited as a follower and will also be a potential candidate for marriage. Benor has decided to help out the city watch, so he is allowed to sleep in the Guardhouse every night between 2am and 9am. He then spends nearly all of his time patrolling the town. After waking up, he spends two hours guarding the Guardhouse by standing on the porch outside then heads down to the bridge that leads to the sawmill. When the clock strikes noon, he spends two hours investigating the mysterious burned-down house in the western part of town. At 2pm he returns to the bridge and at 5pm he heads back to the porch. At 7pm he finally relaxes and heads to the Moorside Inn where he stays until midnight when he heads back to the Guardhouse and paces around until his bedtime. He wears iron armor with matching boots and gauntlets. He wields an iron battleaxe and carries a selection of middle-class items and gold. 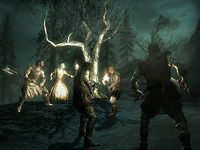 His statements shows why he is helping the guards: "Morthal used to be a quiet place. But then, the world used to make sense. ", "I figure the guards could always use some help, so I keep my eyes open." and "Been hoping they'd make me a guard, but not yet. Still, I'll help them out if I can." He will also state: "The Jarl does little to protect us these days." Benor is also one of the many citizens worried about the presence of Falion: "You ask me, we'd be better off without that wizard in town." and "This isn't the time or place for magic, or whatever it is Falion does." If you talk to him directly, he will claim: "I'm the best warrior in Morthal, and that's no boast." You can then ask him to elaborate what he is doing in town: "Oh, well. You know. A bit of this, a bit of that. They haven't made me a guard, even though I've been asking. So I'll take odd jobs, anything that comes along for now." If you dare question him if he really is the best warrior in town, he will immediately say: "Want me to prove it? I bet a hundred gold I can take you, bare-handed." If you decline, he will just say: "Milk drinker." If you accept, he will challenge you to a brawl: "Just your own two hands. Weapons and magic are out. Now let's see what you got!" When you have defeated him in hand-to-hand, he will get up and say: "Now that was a punch." When he hands you the prize, he will admit: "You're a real fighter. I like that. You ever need my steel by your side, you just ask." He is now available as a follower and is a potential candidate for marriage. Alva: "I'm bored, Benor. Nobody wants to have any fun with me." Benor: "If you leave that kinslayer Hroggar, I would be happy to keep your company." Alva: "Hroggar doesn't have to know if we sit together. Or drink together. I doubt he would even care." Benor: "You tempt me mightily, Alva. But I won't cuckhold another man, even on murderer like Hroggar." This page was last modified on 13 August 2018, at 02:50.